Death She died on 4 December 1994. Birth John Thurley was born about 1677 in Saffron Walden, Essex, EnglandBG. Baptism He was baptized on 22 August 1677 in Saffron Walden, Essex, EnglandBG. Birth Mary Adams was born about 1673. Baptism Anne Thurley was baptized on 1 March 1749 at St Mary The Virgin in Hatfield Broad Oak, Essex, EnglandBG. Burial She was buried on 7 March 1750 in Hatfield Broadoak, Essex, EnglandBG. Birth Sophia Thurley (twin of Sarah??) was born on 17 July 1833 in Great Hallingbury, Essex, EnglandBG. Birth Albert Thurley was born about 1858 in Great Hallingbury, Essex, EnglandBG. Baptism He was baptized on 29 December 1858 at ST GILES CHURCH in Great Hallingbury, Essex, EnglandBG. Marriage He and Julia Hawkins were married on 31 March 1883 in Stanstead Abbotts, Hertfordshire, EnglandBG. Death He died on 8 July 1936 at 3 Hogarth Terrace in Chiswick, London, EnglandBG. Burial He was buried after 8 July 1936 at Plot UC 192 Chiswick Old London Cemetery in Chiswick, London, EnglandBG. 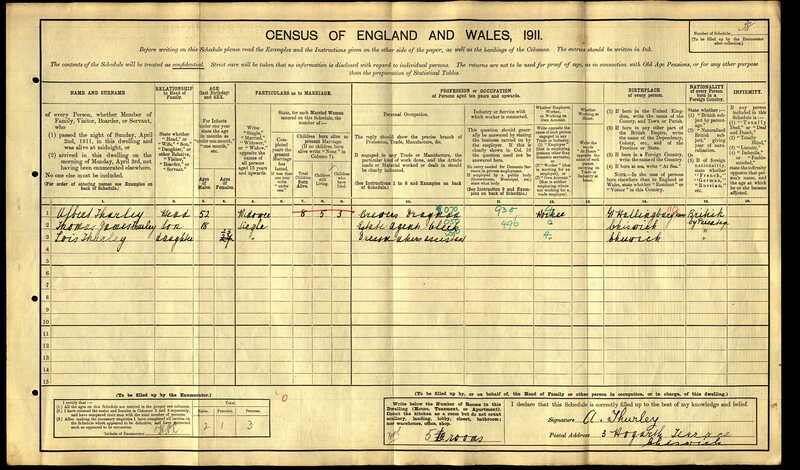 Birth Clare Jane Thurley was born on 11 March 1866 in Great Hallingbury, Essex, EnglandBG. Birth Julia Hawkins was born about 1861. Baptism She was baptized on 9 June 1861 in Stanstead Abbotts, Hertfordshire, EnglandBG. Marriage Albert Thurley and she were married on 31 March 1883 in Stanstead Abbotts, Hertfordshire, EnglandBG. Death She died in November 1891 at 3 Hogarth Terrace in Chiswick, London, EnglandBG. Burial She was buried on 14 November 1896 at Block A Common 46, Chiswick Old Cemetery, in Chiswick, London, EnglandBG. Marriage Harry Thurley and Rosina Howe were married in 1906 in Brentford, Essex, EnglandBG. Death He died on 6 June 1970 at 17a Lorraine Road in Chiswick, London, EnglandBG. Birth Rosina Howe was born about 1882. Marriage Harry Thurley and she were married in 1906 in Brentford, Essex, EnglandBG. Death She died on 22 April 1957 at 17a Loraine Road in Chiswick, London, EnglandBG. Baptism He was baptized on 27 April 1884 at St Nicholas Church in Chiswick, London, EnglandBG. Death He died on 10 February 1934 at age ~54 in Chiswick, Middlesex, EnglandBG.